Hello friends, fancy making some Turkey Club Sandwiches? This recipe is great for Christmas when you have some leftover Turkey that is in need of using up. Transform those Christmas leftovers into a snack lunch with a little cafe chic. Grill the bacon until crisp and golden. Lightly toast the bread on both sides then spread one side of each piece of toast lightly with mayonnaise. 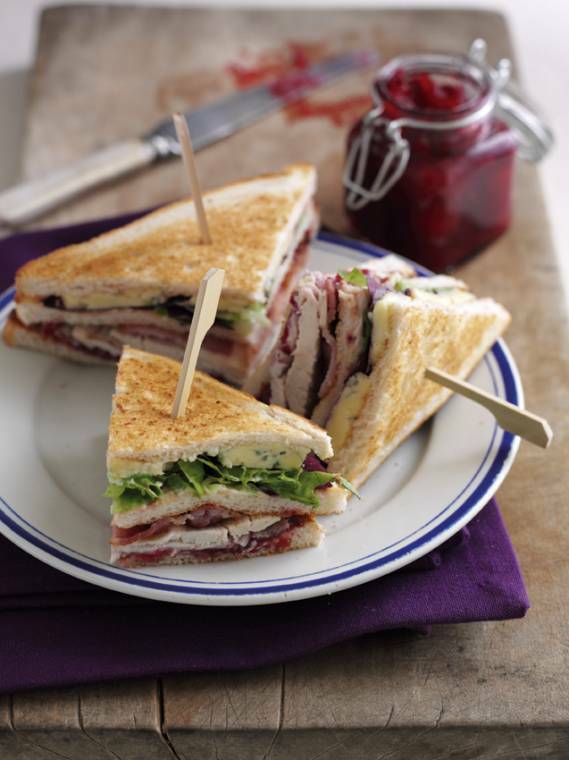 Spread the chutney over two slices of toast then top with the turkey and bacon. Add a second layer of toast to each stack, mayo side uppermost. Add salad and crumbled Stilton then add last two slices of toast, mayo side downwards. Press sandwiches together then cut into triangles, secure with cocktail sticks and transfer to serving plates. What do you think of these Turkey Club Sandwiches? Do you fancy making any? Are you looking for something a little different for lunch? Smocked salmon sandwiches on some bread of your choice, sliced lettuce, tomato, cured ham and fresh mayonnaise, how tasty!? Yum, yum!! Around this time of year like me, you might be looking for some new and tasty recipes to cook up something fun with Turkey!? Today I am sharing a tasty recipe from We Love Maple. Maple Pulled Turkey Sandwiches For Your Christmas Parties. Fancy trying these easy salmon sandwiches from Seasonal Berries out? "Together for Short Lives And The X Factor Charity Single…"
Genius. This looks so delicious I literally want to go and make it now. I think a trip to the supermarket is in order. Visiting from the hop.